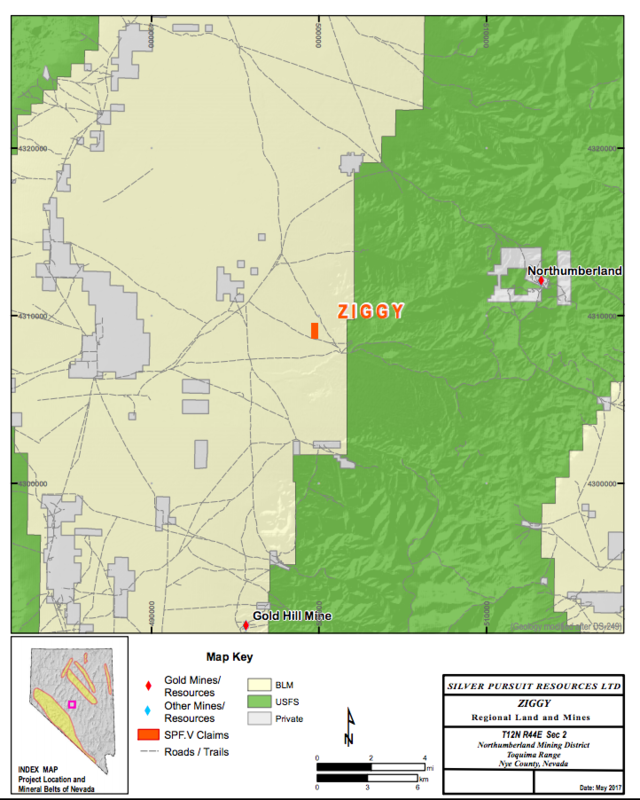 The Zig Project is located approximately 22 miles northeast of Carvers, in Big Smoky Valley, on the west flank of the Toquima Range at an elevation of approximately 6400 feet. The Northumberland Mine is located approximately 8 miles east and the world-class, gold deposit at Round Mountain is located 15 miles south. The Gold Hill mine, located 10 miles south of Zig began open-pit production in 2016. The setting is that of a pediment target with elevations ranging from 5600 to 7220 feet (1707-2200 m) in the prospect area. Disseminated gold mineralization hosted in silty limestones related to caldera-margin feeder structures. Claims in the area have been held by a several companies including Noranda and Newmont. Noranda completed drilling to the south and southeast of the claims, but dropped their interest in 1988. Newmont drilled 12 holes and conducted a magnetic survey in 1991. Work consisted of two phases of drilling. The best gold intercept was in the south holes, where ZI-5 encountered five feet of 0.01 opt Au. The holes on the pediment near the current claims are relatively shallow. 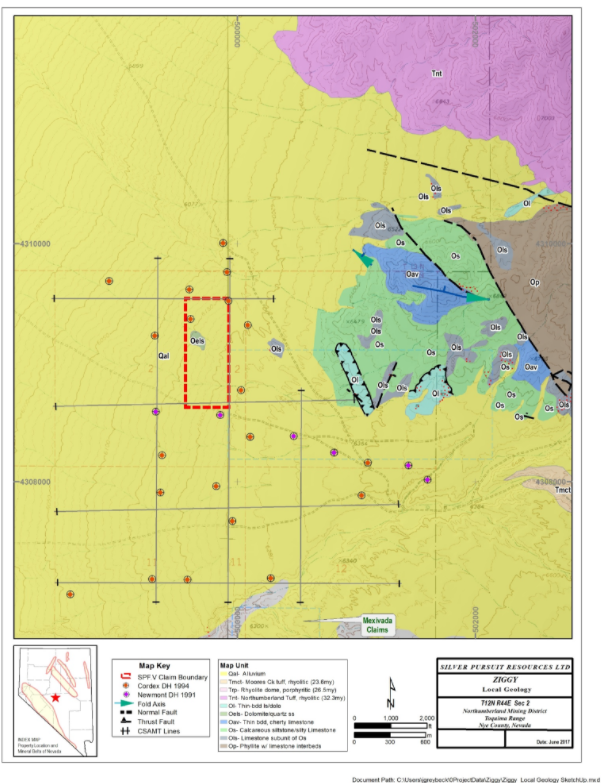 Cordex Exploration conducted operations on the project in 1993 that included detailed geologic mapping, surface sampling, geophysical surveys and RC drilling. Fronteer held claims for several years and dropped their interests in 2013.The scope of their work is unknown. Big Smoky Valley continues to be of interest for exploration. Newmont conducted drilling in the nearby vicinity in 2016. 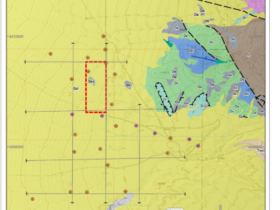 Immediately south of the Zig claims, Mexivada holds claims that have been actively explored during the past several years. Their claims cover a contact zone between thin-bedded limestone and micaceous siltstone which locally is silicified. Mexivada’s maps indicate that there are multiple structures that trend from their claims to the northwest. A few historical workings, situated a mile east of the current claims, is mentioned in the Northern Nye County report (NBMG Bull 99B) and known as the Hill Top prospect. The claims were explored for lead and silver that occur in an altered shear zone developed in the Paleozoic rocks near the contact with Tertiary volcanics. The project geology includes a pediment-covered target outboard of an exposure of Cambrian and Ordovician rocks that exhibit strong iron-oxide staining and have been ductilely deformed by multiple episodes of thrusting and folding. The most favorable host rocks are thought to be the “impure limestone” map units of Ordovician-age. Small Mesozoic intrusive bodies are mapped near Zig and are known as well at the Northumberland mine. The Paleozoic rocks are on the margin of at least one Tertiary caldera margin. The project’s namesake, Mt Ziggurat, is a rhyolite dome dated at 26.5 m.y. This age is approximately the same as that at Round Mountain. Volcanic rocks include the Northumberland Tuff (32.3 my), northeast of the claims and the Moores Creek tuff (23.6 my) to the southeast. The Moores Creek tuff is erupted from the “Toquima caldera complex” which makes up the central portion of the Toquima Range and was emplaced along a northwest trend. 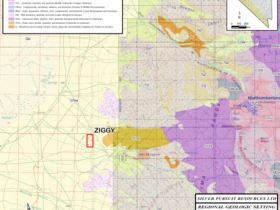 Four stratigraphic packages are present at the Zig Project. All map units have weak to moderate metamorphism with evidence of recrystallization in the carbonates and foliation developed in the oldest rocks which are phyllites. Oxidation effects have been strong, especially in the impure carbonate rocks. Zones of very strong “iron-staining” and color anomalies are present in the outcropping Paleozoic rocks east of the current claims. The oldest rocks in the vicinity are interpreted to be Ordovician Vinini-equivalent rocks, which here are comprised of siliceous facies including chert and siliceous siltstone. Vinini rocks are present southeast of the claims and make up only a small amount of the Paleozoic exposures in the area. The Vinini rocks are part of the upper plate of the regionally significant Roberts Mountain thrust. A second rock sequence mapped near the claims includes graphitic phyllite (east of the claims) and have a characteristic phyllitic sheen. These monotonous gray rocks are designated map unit Op. The oldest non-siliceous rocks are correlated with the Cambrian- Ordovician units mapped near Belmont (25 miles south), This stratigraphic package is dominated by calcareous siltstone (Os) to impure limestone. Limestones within the package occur as intercalations in the siltstone and locally are thicker interbeds (Ols). Limestones in the upper portion of the lithologic sequence have proportionally equivalent amounts of black-cherty horizons and medium gray limestone (Oav). A third stratigraphic package occurs spatially associated with the gray limestone southwest of the current claims. This package (including Oep, Oels) contains micaceous, silty limestone to strongly calcareous siltstone. Locally, calcareous siltstones have a higher sand content. The fourth rock package is comprised clastic rocks that weather a yellow-brown to orangish-brown color. Brownish liesengang banding is common. The mica content of these clastic rocks is distinctive from the other map units of similar lithologies. The upper portion of this package (Oels) contains cross-bedded, quartz- sandy dolomite which grades upwards to quartz sandstones which are overlain by fossilifereous, limestone “mounds”. The most “pure” limestones at the project are thin to medium-bedded limestones with fine, silty partings that define bedding. Previous mapping suggests the unit is, fault-bounded either by low-angle or by high-angle faults. Igneous Mesozoic and Cenozoic rocks at Zig are represented by intrusive rocks and near-caldera outflow facies. Sedimentary rocks include lithified gravels and younger alluvium. Coarse-grained granodiorite, exposed near the Zig project is similar in composition to that described in the Jurassic granodiorite at Northumberland. The presence of this rock suggests that more extensive bodies may be present beneath the pediment. 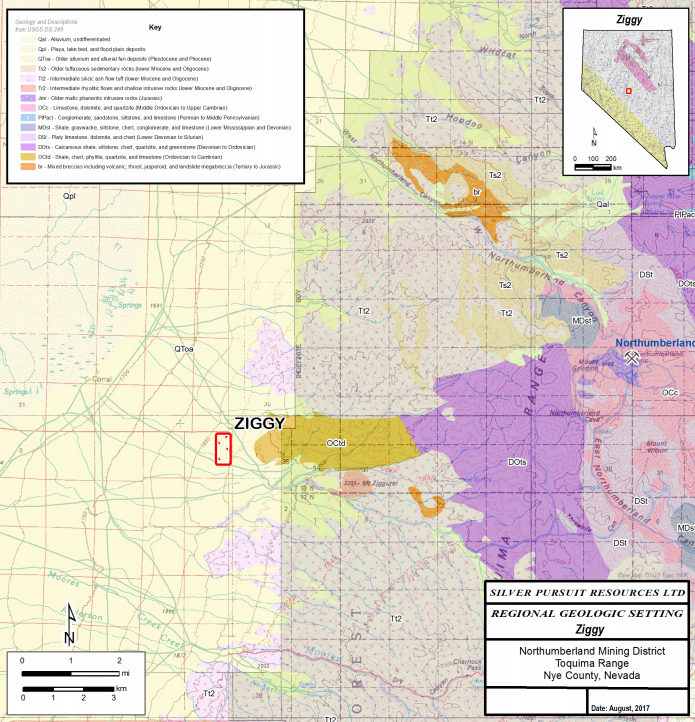 Newmont is thought to have targeted magnetic anomalies in their drilling near the Zig claims and may have explored for sill-like bodies analogous to the occurrence at Northumberland mine 8 miles east of the Zig project. A well-altered, fine-grained dike phase thought to be related to the granodiorite is common in the Zig area. Typically, the dikes are less than ten feet thick and in places, the rock occurs as sills or on low-angle structures. The relative age of the fine-grained intrusive is indicated by the inherited foliation that strikes northwest and is thought to be related to Oligocene tectonism where northwest striking fault structures have a strong component of oblique-slip movement. The extrusive rocks in the project area are Oligocene age and include the Northumberland Tuff (Tnt) to the north, and the Moores Creek Tuff (Tmct) to the southeast. The volcanics have local zones of iron oxide staining, but in the near vicinity are mostly unaltered. The Mt. Zigguart porphyritic rhyolite (Trp) is dated as Oligocene (26.5± 0.7 m.y.) and is exposed as minor “satellite” bodies outboard of Mt Ziggurat. The argillic alteration and iron-oxide staining near the rhyolite porphyry suggest significant hydrothermal activity was active when the porphyry bodies intruded the Paleozoic rocks. In a few places, the rhyolitic porphyry occurs along structural boundaries between Ov and Oav map units. Though no precious metals have been recognized in direct association with Trp, strongly anomalous mercury concentrations are reported from samples of porphyry with dark brownish-red, iron-stained zones. Mercury often occur in high-levels of epithermal mineralization and in Carlin-type mineralization. Younger sedimentary rocks which make up the pediment at Zig appear to have a least two distinguishable subunits and the distribution of the two types suggest structural controls, either related to relief in older bedrock or related to Tertiary extension and basin/range faulting. The presence of subunits in the pediment gravels, is noted in the drill logs available from previous operators. Rocks in the Zig project area have undergone brittle and ductile deformation. Brittle events may have utilized zones of structural weakness developed during older thrust faulting. Thrust faulting is evidenced by discordant contacts between map units with similar “sheet dips” and dikes intruded along the low-angle structures. Normal faults have northwest to northeast orientations. The oldest set of NW-trending faults are thought to have a significant component of oblique-slip. This may be related in part to Oligocene volcanism. 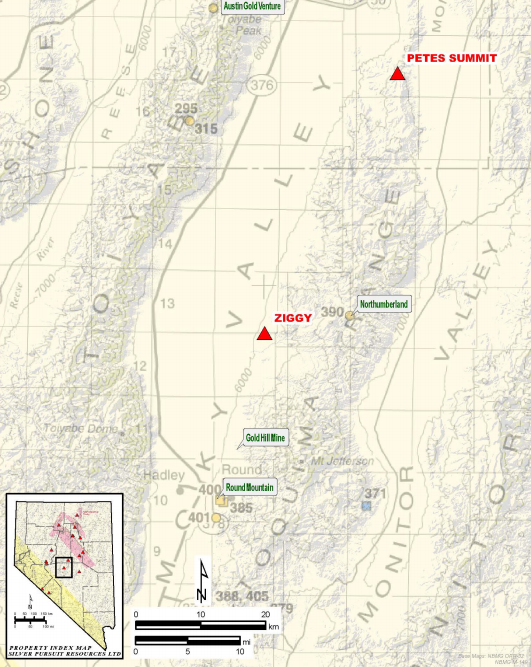 The Zig claims are situated along a large-scale northwest lineament that coincides with the Toquima Caldera complex, described and mapped by Boden (1992). Youngest basin and range faulting tends to have north to northeast trends and are thought to have a principal component of dip-slip displacement. The better target zones are thought to have a northwest structural control. Rock chip sample data from the Cordex work at Zig suggests there are two episodes of mineralization near the Zig claims. A technical report prepared for Mexivada, on claims to the south, proposed a similar conclusion. An earlier event is represented by the style of mineralization such as that at the Hill Top prospect (one mile east of the current claims). This is a copper-zinc (with lead and silver) event that is related to white quartz veining. Results of sampling suggests Carlin-type mineralization is present and appears to overprint the base metals. 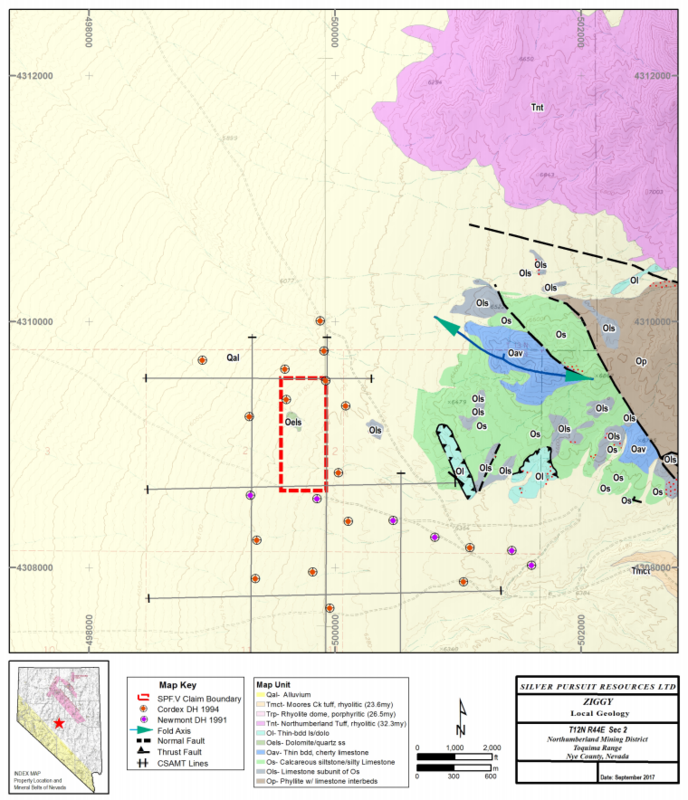 The report prepared for Mexivada proposes that “Bald Mountain-type“ gold mineralization is a second target concept on their claims. Geochemically anomalous samples are silicified to varying degrees. Jasperoids are formed along high-angle and low-angle structures that cut the Paleozoic limestones and calcareous siltstones. Other zones of silicification are more subtle; only weak silica-replacement or in a few instances, where not eroded, the rocks are “sanded”. The geochemical signature of the later episode of mineralization shows gold has an association with arsenic, antimony and mercury. White barite veining is not uncommon in association with gold-bearing samples as well. Reports summarizing Cordex sample data indicate that antimony tends to be the strongest pathfinder to gold at the claims. Arsenic is less strongly correlated. 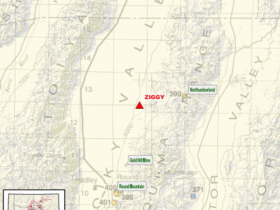 Ground preparation for a bulk-minable gold deposit at the Zig project is thought to be related to the development of the N 25-35 W structural grain, along which the Toquima Caldera complex formed. Although only a few, low-gold values are observed in relation to this trend, other mines in the region exhibit northwest controls to gold mineralization. At Round Mountain, Tingley and Berger (1985) indicated that ‘Veins are oriented northwest to west”, as does a broad zone of argillic alteration. Descriptions in the county report of the Belmont District indicate productive veins have north to northwest trends. At Manhattan, doming along an east-westerly axis is related to exposure of mineralized zones with north-northwest trends. The influence of folding is also thought to be important to the localization of the mineralization in the Zig claim area. Silicification is observed along hinge zones of map-scale folds east of the Zig claims. Mexivada’s technical report describes the importance of folding with respect to hinge zones oriented ENE in the Paleozoic rocks, south of the Zig claims. “Interference” patterns of superposed folding result in structural culminations where hydrothermal systems may concentrate precious metals mineralization. Additional rock chip sampling is planned for the altered and mineralized outcrop covered by the current claims at Zig. Sampling will also include rock chips from outcrops nearby where favorable alteration is mapped in the Paleozoic rocks. Approximately 18 line-kilometers (from 7 lines) of CSAMT geophysical data, collected during 1993, is to be reprocessed using state of the art technology. Results of the reprocessed data will be evaluated for potential targets beneath relatively shallow pediment cover based on resistivity. 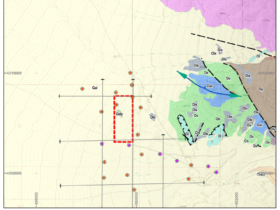 Targeting will also include evaluation of potential structural culminations related to the northwest-trending folding and faulting beneath relatively shallow cover at the project. Pediment-covered targets will be tested with drilling.